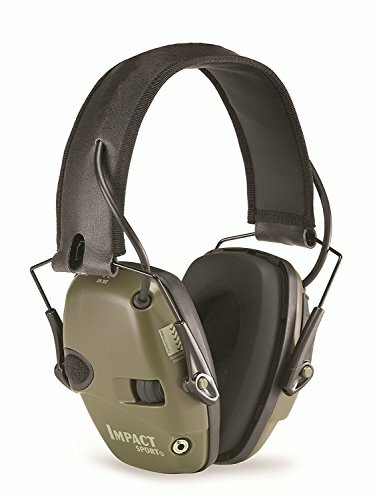 / What are the best Shooting Ear Protections? Many people enjoy the sport of shooting and hunting, both of which involve the use of firearms as the main piece of equipment used. Whilst this is both a fun and enjoyable recreational use for a potentially dangerous tool, there are more than a few safety factors that need to be taken into account before operating one. Firearms are deadly pieces of equipment and require both respect and care in all forms of their use. Additionally, whilst you are providing care and attention with the weapon, you must also do the same with yourself, ensuring that you are kept in a safe and controlled environment and that you consider all safety precautions to ensure that you and your participants see no harm during your recreational use of firearms. One such precaution is the use of ear protection, something that can often be forgotten by rookies and over confident professionals alike. Hearing protection is essential when operating a firearm, particular shooting ear protection as they are designed with the right factors in mind to keep your ears safe from the loud exertions of noise and pressure that arise from the barrel of a gun. But there are number of varieties in hearing protection as well as specifications to consider that can change depending on your situation. 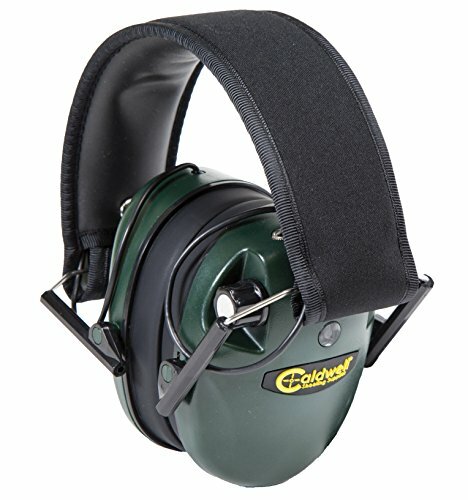 ​How to Choose the Best Shooting Ear Protection? ​What Decibel is Considered Harmful? These passive earmuffs provide adequate protection against noise that may damage your hearing permanently. This is best worn by people who are exposed to sounds higher than the normal threshold our ears can handle, which is 85 decibels. Constant exposure to noise higher than that can lead to permanent hear loss and reliant to hearing aids and apparatuses. For its price, which is a little over 20 bucks, you’ll be able to save yourself from damaging noise and keep your hearing as normal as possible. This muff has a fairly high Noise Reduction Rating of 30 decibels, higher than the usual NRR of other passive earmuff models. 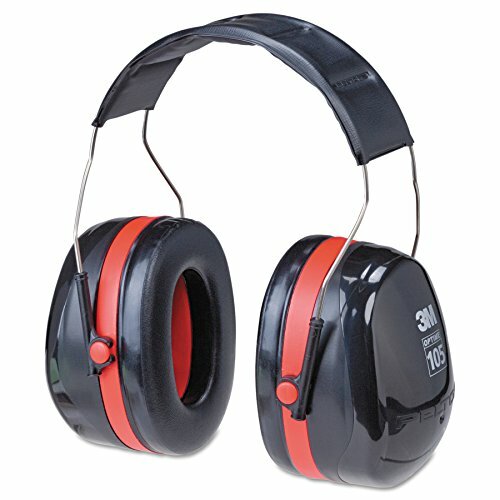 This is capable of protecting your ears against loud machineries, especially work-related, gunshots, and many more. It features a superior comfort fit with its foam-filled muffs, which doesn’t only absorb the noise but also keeps your ears comfortable. The stainless steel padded headband is adjustable so you can easily lengthen or shorten it depending on desired height, for a more comfortable fit. You don’t have to worry about your muffs getting in the way or to constantly rearrange. The materials are also made of sturdy plastic and metal so you can rely on these muffs for years to come. ​These muffs are a bit heavy because of the sturdy construction. Although the headband is padded, you might experience some pressure at the top of your head after hours of wear. You might find that the cups are a bit big too; although it’s good at protecting your ears from noise, it can cause some discomfort because heat can build up inside the muffs. To alleviate the poor ventilation, you can momentarily take your muffs off to cool your ears down. These muffs are recommended if you’re always on the go, especially when you use it during sporting events like shooting and hunting. The design is very compact so you can easily slip it into your range bag and take it anywhere without worrying about it getting accidentally damaged. The muffs are foldable, to protect the inside cushions for longevity. To top it all off, these muffs are also very lightweight, weighing only 40 ounces. The ultra-sleek muffs come with super soft ear cushions filled with liquid or gel to keep your ears cool during prolonged periods of use. The headbands are made of durable cloth, which is carefully padded so that it won’t put too much pressure on the top of your head. The headband is connected onto the muffs through a durable steel wire that can be adjusted to your preferred length, so you’re certain that it will fit your head snug no matter what the size. Because of its great noise reduction, comfortable fit, and portability, users can also wear it outside of the range. Some use their muffs when doing loud chores at home or taking it to noisy places like a sports arena where cheering crowds may hurt your eardrums. You can even wear it at home during times when your neighbor throws a party for a hundred people. ​Not all customers are very happy with their purchase with most of them complaining that the ear cups are too small and the maximum length adjustment is not enough. To avoid encountering these problems, it’s better to first try these muffs in a store before purchasing them online where you can get a better deal. These muffs are electronic muffs capable of sensing very loud noise (over 85 decibels) to automatically shut off and block the noise off the ear cups, thereby effectively protecting your ears. At the same time, it can also capture soft sounds and amplify it so you can better hear your surroundings and engage in conversations, all while keeping your muffs on. 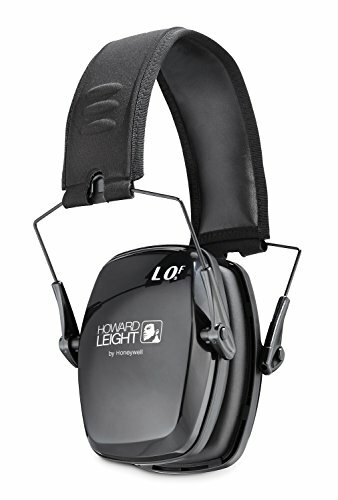 The Howard Leight electronic muffs come with external audio input that is amplified so you can hear soft sounds such as voices, footsteps, and movements. This is helpful especially if you are tracking a game on your hunts. It has a noise reduction rating of 22 and automatically blocks noise over 82 decibels. The muffs are also very sturdy and compact enabling you to pack it onto your range bag and go. You don’t have to worry about breaking or getting deformed because you can neatly fold it to cover the inside of the muffs. The in-built microphones on each side capture low-level sounds. It is equipped with a single power and volume control run by two AAA batteries. An external audio input allows you to connect your iPod or other audio source. ​Some users found the noise protection of these muffs inadequate. Noise levels vary, while these muffs can handle most of the noise above 82 decibel, it may not be enough to protect you against noise higher than that. Gunshots go over 160 decibels depending on the caliber of the firearm. One owner took this to a carbine class but found the noise still piercing through the muffs. ​This is an electronic muff aimed at protecting shotgun and action shooters. It comes with two in-built microphones that amplify sounds below 85 decibels to help you converse comfortably with fellow shooters or hear movements caused by the game you are tracking. For protection, it shuts off the microphones for a split second for noise above 85 decibels. The muff comes with volume control that amplifies environmental sounds from 0-20 decibels. For all day or hours of wear without discomfort and fatigue, it is covered in cushions that are not completely airtight so it can continuously cool your head. The headband is fully padded and lined with soft leatherette so it can sit on top of your head without providing too much pressure. The metal connecting the headband to the cushioned muffs are also adjustable so you can fit it snugly. It runs using two AAA batteries and weighs only 12 ounces. Very few customers complained about the performance of these muffs. While they enjoyed it for a few weeks of use, they have noticed that the blocking capacity of these muffs started to lag after continuous use up until it doesn’t effectively block the noise out. The lag seems to be an isolated problem as only few customers experienced it. This is an in-ear protection or earplugs that is directly worn to block the passageway onto your ear canal. It’s small yet powerful because of its electronic capabilities that block noise over 85 decibels out. It is a low profile design that allows you to keep it in place while wearing a mask, helmet, or hat. This is recommended as a supplementary for earmuffs, especially when going hunting or shooting and big calibers of guns are used. This ear protection is made of soft, hypoallergenic, medical-grade polymer that won’t cause discomfort to the innards of your ears. The materials are pretty lightweight so you would feel like you’re not wearing anything at all. It functions pretty well as it comes with a noise reduction rating of 19 and can easily block noise over 80 decibels. At the same time, it can amplify safe sound levels so you can hear it effectively as if you’re not wearing earplugs at all. The best thing about this ear protection is its affordable price, sleek façade, and capabilities. For something so small, it blocks away very loud noise with ease. ​The only downside for this is that it doesn’t fit all ears. Some people have complained that it’s either too tight that it’s uncomfortable or too loose that it doesn’t block noise effectively. If this is the case, it will either pop out because of tightness or fall on its own, causing you to accidentally lose it eventually. It’s important to try it on first (if you can) before committing to buy it. If it doesn’t work for you, it’s better to purchase electronic earmuffs, as these are more versatile when it comes to size. Essentially there are three main categories that general and shooting ear protection fall under when looking for the best piece of protective equipment use. They include earplugs and earmuffs as the two main points of hearing protection. Earplugs are as the name implies; they are plugged into your ears, whereas earmuffs are placed over your ears. But these two categories do not provide the standalone choices, with a variety of features inclusive in each type. Among the list of possible hunting earplugs that you may want to purchase include electronic earplugs, reusable shooting earplugs, foam earplugs, no-roll foam earplugs, do-it-yourself custom molded earplugs, professional lab custom molded earplugs, moldable silicone plugs and moldable wax earplugs. Foam earplugs provide the most basic of cover with earplugs, being a one-time use and cheap to purchase. Extended use of one-time use earplugs can be done but over extended periods the quality of these deteriorates and the strength of hearing protection that they provide will lessen. Additionally they are not as easy to clean; most foam earplugs will end up soaking in dirt, dust, earwax and other bacteria making them a breeding ground for possible infections that could cultivate inside your ears. After that you have the customized earplugs, which can be molded to suit the shape of your ears and also adjust so that they are comfortable and also protective. Finally there are the electronic types of ear protectors that have the ability to protect your ears from loud and sudden impacts whilst amplifying ambient noise, making them perfect for hunting or stalking and saving your ears from the pain of a ringing gunshot. Earmuffs are slightly ore simple, with this form of hearing protector generally being less customizable but still having options such as electronic shooting earmuffs and also military and policy quality earmuffs. The standard earmuffs cover your ears and provide a headband over the top to keep them firmly in place. The materials used help to pad around your ear and are soft and comfortable to prevent aggravation of soft and delicate skin. Electronic ear mugs are similar to electronic earplugs in the sense that they help you to hear greater sounds in your surrounding environment but are fine-tuned to block off loud noises such as gunshots of heavy machinery. Finally there are military and police quality earmuffs that are created for tactical purposes, that follow the same conventions as electronic earmuffs but allow for communication with other personal attached to the related radio channel, allowing you to keep in constant communication in the midst of a high noise environment. Now you might be asking “I know the different types, but how do I determine what is the best shooting ear protection for me? Is it an ear plug or an ear muff?” Aside from personal preference on these two categories, you will want to dive further into the specifics of these ear protectors. Noise is the main factor to investigate, but have you stopped to ask yourself “How loud is loud?” and “How much noise will the ear protectors stop?” It is different for each type, some providing better protection than others. Firstly, firearms are the source of the loud noise and you will want to learn the specifics of your weapon so you can cater your hearing protection accordingly. With a rifle you would want to check the frequency (low to high sounds measured in hertz), duration (How long the sound lasts) and the intensity (the range of the sound measured in decibels). Frequency is important, as this is a line of the differences in sound. One loud sound can be different than another, as indicated by frequency. Frequency acts as a sort of sound fingerprint, and can have an impact on your hearing when coupled with high dB levels. Firearms produce a particular frequency and prolonged exposure will cause damage at certain spots along the frequency line. This is reduced by ear protection but serves the purpose of reinforcing the notion that protecting your ears is paramount. Disposable earplugs have been measured to provide protection of around 25-32 dB and are very inexpensive. Earmuffs whilst slightly more expensive in comparison still do a god job and protect roughly the same level of dB as the earplugs. A common myth about the two is that using both earplugs and earmuffs will amplify the level of protection that they provide. This is false, and does not hold any weight at all. The only purpose wearing both earplugs and earmuffs provides is to create separate barriers that the sounds must travel to and offers only a limited improvement of protection; it does not double the effective dB range of protection. Most firearms produce noise at around 140 dB that is enough to deafen you. Even a small .22 caliber rifle can reach this range, with larger big-bore rifles stretching up to 17dB. Even though these noises are only small instantaneous bursts and not consistent, it is still important to consider and decide on your hearing protection accordingly. Stronger shooting ear protection will be essential particularly if you’re in an environment where there is a consistent amount of shooting and the time between shots is minimal. As a safety warning, experts state that exposure to around 8 hours of continuous noise around 85 dB is enough to cause permanent hearing loss, whilst pushing this up to 100 dB drops the tolerance time down to 2 hours, and 115 dB would lessen it further to around 15 minutes or less. A sudden spike up to 130 dB or more can also do the same and cause permanent damage to your hearing in an instant. With this in mind, you definitely want to ensure that your hearing protections stops you from getting anywhere near these ranges. Most protective equipment will have the appropriate labels on the packaging to give you an indication of their working range; in this case the dB level of protection should be shown on the packaging with the higher number indicating the highest level that they can effectively silence. You may be wondering about how this all adds up. “If an average rifle produces 140 dB and I am wearing earplugs that protect against 30 dB, what does that mean to my ear protection?” Firstly, It does not mean you will be receiving 110 dB. The noise from the muzzle of a firearm will travel forward and the point of reference is extended away from your body, therefore lessening the amount of noise that actually reaches your ears. Secondly it is important to remember that hearing protection does not eliminate the noise but reduces the impact that it has and provide support against long lasting damage. The effectiveness of hearing protection works on a cumulative basis, not an instant one, so whilst you may still be getting a high level of noise reaching your ears you will still be protecting yourself from permanent damage years along the track. However, if you’re just in the mood for some lighthearted range shooting then there is nothing wrong with picking up some foam earplugs. No matter what, always have enough ear protective equipment, not just for yourself but for the others around you as well. You would want to read more ​​shooting ear protection reviews with our article, "​​What are the best Shooting Range Ear Plugs? ".